Finally managed to score a Mavic 571 rear hub. It came to me with an original, and as far as I can tell, unused, 13-23 Mavic cassette. The original skewer wasn't present; fortunately I have a correct one. It's not the 571/2HG, so its unlikely I'll use it any time soon -- it would require actually shifting (ha!) 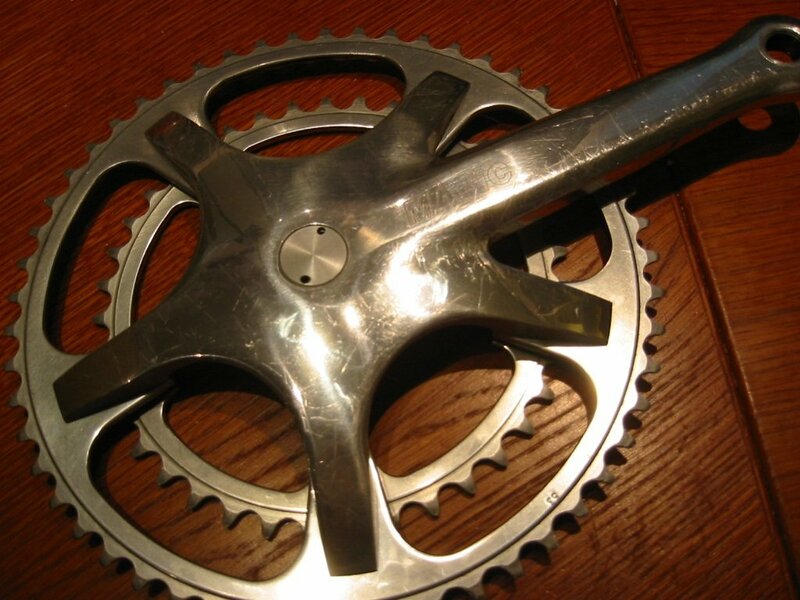 to 821 shifters, or Shimano 8 speed brifters...neither are options I'm particularly interested in at the moment. If I stumble across a suitable rim, maybe I'll build it up. Just in case, ya know, I decide to try it out. A comment in my last post got me writing a comment back. Went long enough that it might as well be a post. It started with the fixie -- though I'd like to go on record as having bought said Pista in 2002, prior to the current ridiculousness, and I sold the thing off to a (way too short) hipster for more than I paid. The geek part started with the blue Merckx. I had gotten a ridiculous deal on a barely used Bianchi XL Boron. Being as powerful as I am (and smooth too! ), I must have flexed it too much when riding, cause the clear coat on it developed spiderweb cracks on the top tube. Not the tube itself, just the paint. It kind of freaked me out a little, though. But mostly, it made for an excellent excuse to get a new frame. So I started looking around for a new frame on eBay, when I saw the blue Merckx. "It must be mine!" I thought. Or possibly said to myself, the cat, or my wife, who at the time was just my new girlfriend, and infinitely less likely to opine "its nice, but where are you going to put it?" Anyhow, it ended up selling on eBay to someone else, for more than I was willing to pay. I was sad. So I started doing some research. Merckx Grand Prix are rare, as I began to learn. Depression set it. I'd never have that bike! Then suddenly it happened. Apparently, the guy who outbid me had a wife or something who did ask where he was going to put it, and the frame was being put back up on the block. For 7 tense days I watched + waited. 10 seconds left, I submitted my bid. My browser spun the little loading arrow. Was the Internet going to conspire against me? Would my bid go through? As you probably guessed, it did. i ended up getting it for less than I had been willing to pay originally, and less than the guy had got it for. That was almost exactly 3 years ago now. It's morphed in to a mostly-Mavic equipped ride, but its still rocking the Ultegra 600 brakes my friend Jeremy (who spurred this post) gave me so I wouldn't kill myself riding a brakeless fixie. Thanks man! The Merckx, just arrived, 2004. I just got another Merckx -- the older one seen in the recent posts. My wife hasn't given me the "where are you going to put it" look yet, but I've already torn down my soon to be old commuter bike, in preparation for getting rid of the frame + pieces I won't be using on this bike. I figure being proactive buys me something, right? 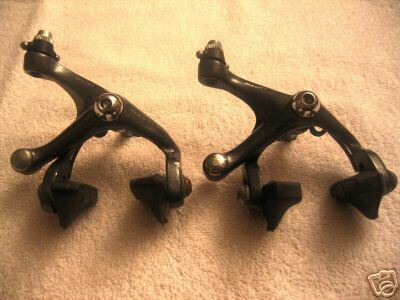 Just got a nice set of C-Record/Croce d'Aune brake levers. These are going to be paired up with a set of CdA Delta's, to be used on the new Merckx. Still not sure of the date on the Merckx, but I'm not all that concerned. Its just an excuse to build up a fullish CdA bike. Even going to try using a set of Syncro's in indexing mode. The levers arrived in pretty dirty condition. I spent 30 or so minutes cleaning them up, and they look fantastic. Left is before, right is after. Hot soap and water can really work miracles when it comes to brake hoods. is finally mine. I managed to snag one on ebay for a song -- literally at 25% of the cost it should have gone for. Go me. Click for a bigger picture. Its got the usual array of scratches and scrapes. I tore it down, cleaned it, and rebuilt it. Its very smooth. Its about half an ounce heavier than a Shimano Ultegra 600 rear (RD-6400), so I won't notice its extra weight. Now I just need to mount it up, set the limits, and see if I can't get it working on a 9 speed setup. It has a ton of range, so I don't think its going to be an issue. Modolo made a whole variety of brakes, particularly in the late 80's and early 90's. Eventually I'll get around to cataloging the earlier "Professional" style calipers, but here's a rundown of the SLK family. Click any picture for a larger version. The Equipe. I think this just may have also been designated the KX90. Definitely a pattern with different names for what amount to different finishes -- these look identical to the ALX90's. Can you spot the differences? Slightly different stripes on the brake arm, and the graphics on the levers themselves. Uh oh. The Master SLK 90. Looks just about 100% identical to the above, but in a white finish. Finally, the Mach. This is a Mach I, the lowest on the totem pole. Still a nice brake. The fixing hardware is different. They also came with cheapy, molded brake blocks. But I'm not sure on the top 3. They're extremely similar. I'd only put the ALX90 below the Master SLK + Equipe due to the lack of graphics on the brake levers. Very scientific. One things for certain. This family is where the Mavic 440 comes from.